If you thought you couldn't afford your dream kitchen, think again! Find out how to get the look of butcher block countertops for next to nothing—just a handful of freebies from your local hardware store. This story starts at the curb, where people leave out the things that they no longer need. Between neighbors’ recycling bins and trash ready for collection, DIYer Naomi Huober of BLDG 25 spotted—and scooped up—an old cabinet destined for the dump. Sure, it was dinged up and missing a top, but it had great bones; painted chippy white and complete with wrought-iron fixtures, it boasted a straight-from-the-farm feel. All it needed was a custom-fit countertop to blend with her existing room design. Wanting to keep total costs low on this freecycle project and play up its country style, Naomi circled the local hardware store until she stumbled upon an unlikely solution: wooden paint stirrers. Wood countertops are hallmarks in today’s kitchens, popular for their beauty and durability. At up to $100 per square foot, though, a butcher block top wasn’t in the budget for this cabinet makeover. Instead, Naomi pieced together 30 of the free wooden stirrers across a plywood top to achieve just the right look for a fraction of the cost. You, too, can apply her simple idea to a tabletop or cabinet refresh. Simply use a ruler and handsaw to cut each stirrer before the curve in the wood so you’re left with all straight edges. 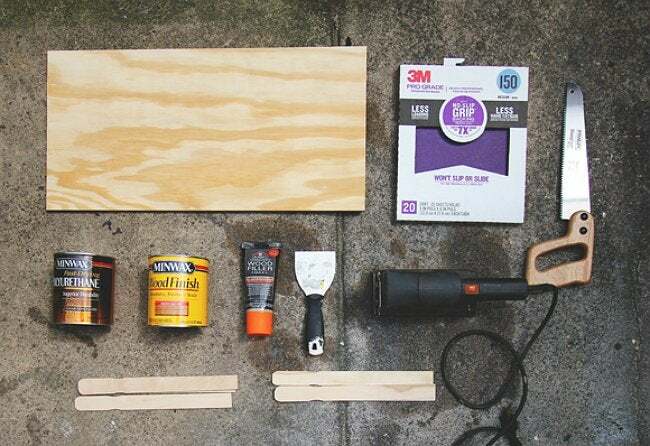 Then lay them out on your surface: Starting at a corner, work your way towards the center one strip at a time, applying wood glue to the tabletop and pressing each stirrer in place. When you’ve reached the opposite sides, cut the last of the paint stirrers to fit the remaining space, glue, and sand down the edges. Fill any gaps with wood filler, and come back in an hour to sand the surface and apply the stain of your choice. Before you wrap up, seal with two coats of polyurethane so that no water can accidentally do damage to your finished project. 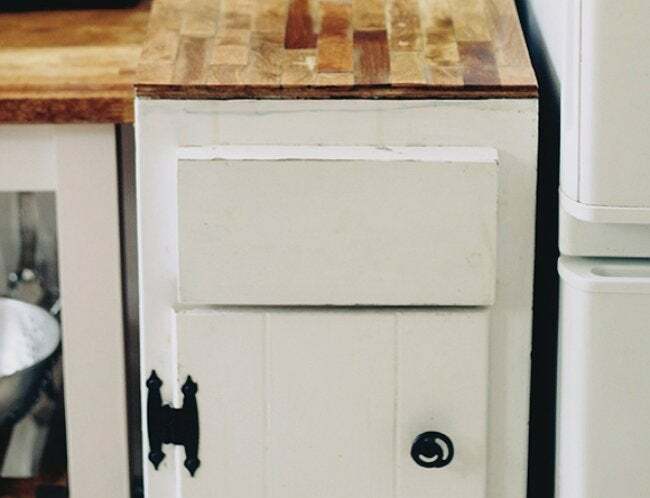 The clean vertical lines, wood grain, and staining of plain old paint stirrers transformed this once-boring plywood top into a convincing faux butcher block counter overnight—talk about the easiest remodel ever. And if anyone asks, don’t worry; your secret is safe with us.